1UZ 2UZ 3UZ Manual Clutch and Transmission Parts, Accessories & Adapters. We ship globally!! Real employees, real tech support 24/7 365 Days. - Toyota W55 or W58 Transmission to 1UZ Adapter Kit! Sold as a Complete Kit Only. This listing is for the older version of the kit that is no longer available. The new version is all aluminum. Check the listing below! The 1UZ series of V8 engines is making it's way into so many different swaps and platforms and for many that ran the Toyota W55 or W58 transmissions there was no solution. There is now. This is it guys! This kit is custom made in-house with CNC design and manufacturing! Comes with the T56 Hydro-throwout for a zero fuss install. 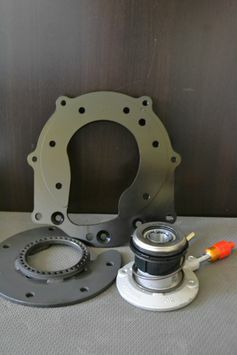 Also includes adapter plate, release bearing, and release bearing adapter kit. This allows the use of the W58 or W55 transmission with your 1UZFE V8 swap. It typically takes us about 5-7 business days to assemble a kit for shipment, so please plan your project accordingly. We ship all over the world, so if you're country is not listed, order online and we will quote you shipping before we charge your credit card.